I was reminded of that quote yesterday as I attended the funeral for the husband of a friend of mine. It was a very sad affair, as all funerals are, but was made all the more poignant as they would have celebrated only 17 months of marriage on Saturday. He was 50 years old. My heart was torn at the sight of his wife, and the rest of the family, having to pull together to make sudden arrangements to say that final goodbye to the one they love. The word love is on purpose, not loved. It does not end because someone is no longer here, nor should it. His passing should be a clarion call to us all to appreciate and love those we have in our lives, every single day. Do what you can to show it today, not tomorrow, as there may not be one. A sobering thought, that very few of us actually recognize. We all have an immortality complex. Have you raised you voice harshly to someone you purport to love in the last week, day, hour? Was it over a trifling matter, something so insignificant it was only used as a vent for your bad mood? Did it cut, was it meant to hurt or make someone feel small or bad? Go apologize. Now. Start to live seeing the big picture. None of us are perfect – not them, not you, and certainly not me. But you love them for a reason – remember that every time you open your mouth. Be supportive, be helpful, be an ear to listen and shoulder of support. Reduce the liquid in the pot. Of course there are serious things in relationships that need to be discussed. Most often they stem from selfishness or rigidity. Communication is key. But do it in a way where you do not denigrate the opinions of those you love; cultivate a cooperative atmosphere where issues can be discussed calmly and solutions found. There are no winners and losers in a healthy, loving relationship. Love and living together is about give and take. What you decide together will make you stronger than what you decide alone. And those joint decisions will lead to new avenues of choice that you may never have dreamed possible. Remember that life can be short and brutish, and inherently unfair. Live life like there is no tomorrow, and always treat those you love in a way you would wish to be treated. If you live life like this, if the worst does happen, you will not look back with regrets. Happy memories, smiles and laughs are far better ways to remember those we love than living with self-recrimination because of how we acted. We can’t change what happens around us, but we are in total control of how we react to those circumstances. The two saddest words are “what if...”. Luckily, my friend and her husband lived the words I wrote above. The only regret is they had far too little time together. 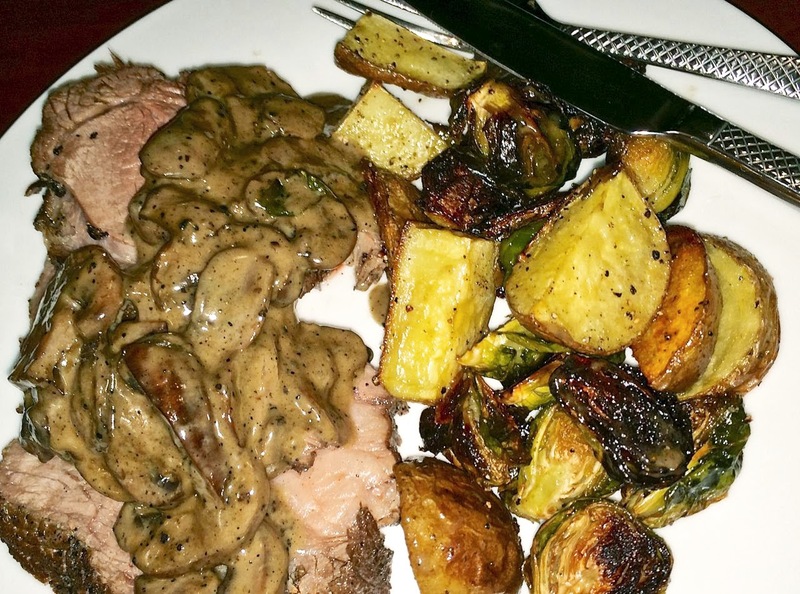 What does this have to do with braised beef roast? Nothing. But I’m giving you a recipe anyway. It may be a way to enjoy the company of those you love, and have some of supportive conversations you really should be having, over a lovely meal. Preheat the oven to 325°F. Mix together the pepper, garlic and salt and rub the mixture well into the surface of beef. Heat half the oil in a Dutch oven or other heavy pot with a well fitting lid. Sear the beef on all sides. Remove to a plate. Add the remaining oil to the pot. Sauté the mushrooms until they start to colour. Push them to the sides and nestle in the beef. Pour the wine around and bring to a gentle boil. Then reduce the heat to medium low, cover the pot and bake. If your pot lid doesn’t fit well, cover the top of the pot with heavy aluminum foil and then place your pot lid on top. Fold the hanging foil up over the lid, for a slightly better seal. 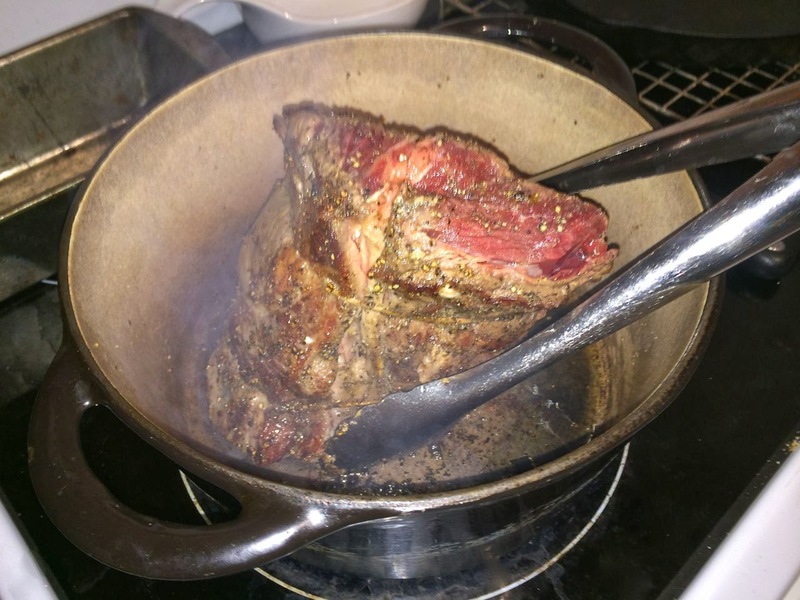 Bake the roast for for 1 to 1.5 hours, testing using a meat thermometer at the hour mark for doneness. Interior should read 140 to 150°F for medium. Remove from the heat. Let sit for 15 minutes, tented with foil to keep warm. 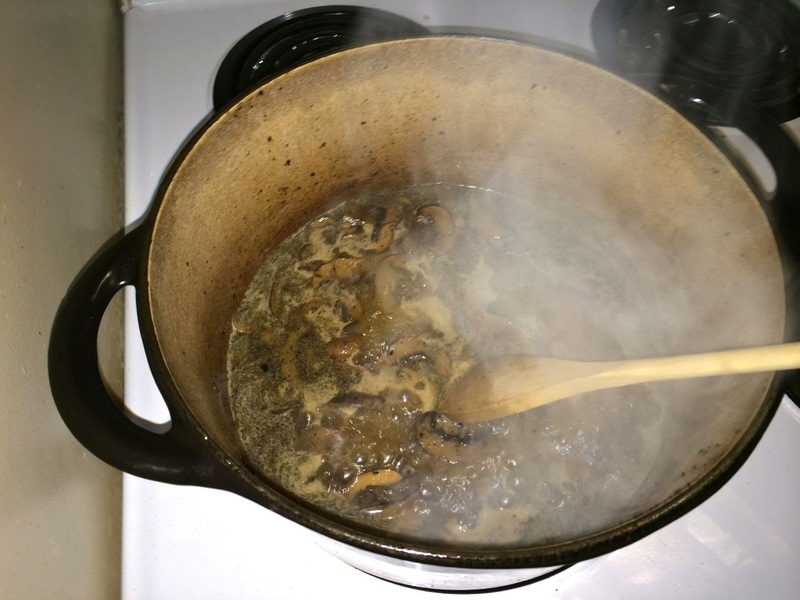 While the roast sits, bring the liquid and mushrooms in the pot to a boil, and let cook until the liquid has reduced down to about 3/4 of a cup. Add the cream and boil until reduced to sauce consistency. Taste the sauce for salt and adjust if desired. 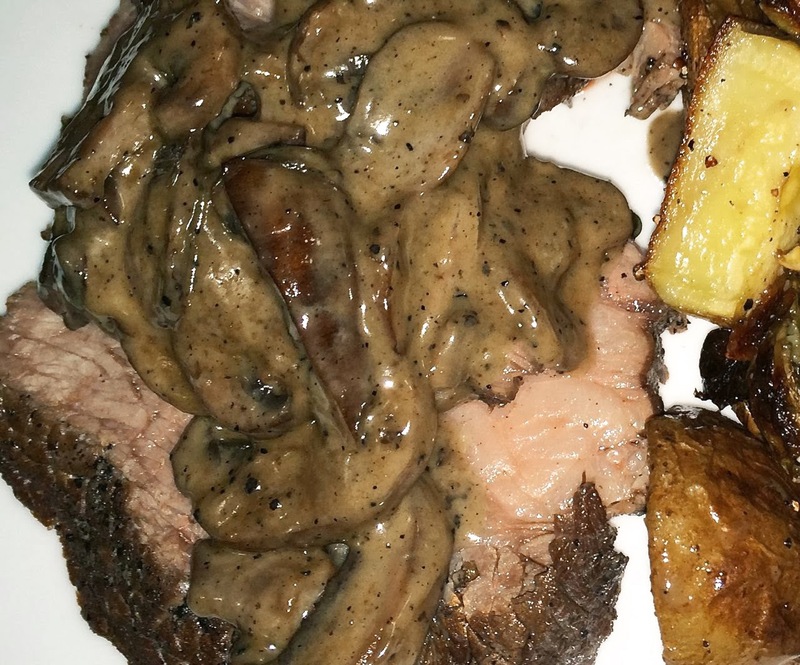 Slice the beef and serve the mushroom sauce on top.